In our work with the Ottawa Carleton District School Board, we have the opportunity to work with educators and children from across the city. In Nearby-Nature or on our forested site, we meet with 2 classes from a selected school for one day/week for 6 weeks. We get to sink in, play, explore, and learn with these children, their educators, and family volunteers. Though different in many ways, this program is also very similar to our community-based programs (in which children are signed up and dropped off by their families). Our time on the land is all about connections. We strive to nurture connections- to ourselves, to each other, to the land. We explore the same land a number of times, walk the same trails, splash in the same puddles, climb the same trees, so that we can truly get to know it- how it feels, smells, sounds- in rain, sunshine, snow. We offer children the opportunity to lead their own learning and play, to listen to the feelings in their hearts, heads, and bellies. We invite them to make choices to do what feels right- for them. It all sounds lovely- engaging, stimulating, curiosity-nurturing, supportive of children who struggle to be still or indoors or quiet. It is lovely. And it’s challenging. We work with many families who are experiencing winter for the very first time or who have never learned to love it. Many have never seen or touched snow, have never needed to acquire winter gear before. Some don’t know where to get the gear, or how to afford it. Other families cannot read the forms and links that we send home- because they do not understand english or because they do not have time between jobs or because they do not have an internet connection or working device at home. We work with children who have never experienced winter cold, who do not yet know how much cold they can feel while still being able to play and learn, who haven’t learned to run around to warm up, or to tuck their snow pants over their boots, to keep their hats and mitts on. There is a fine line, ever-shifting, ever-negotiable, often surprising, between making space for children to learn how to play and cope and adapt to cold weather and children going too far, being out too long, feeling cold. A very fine line. we talk to children about speaking up when they’re cold, learning the difference between feeling a chill and being too cold, checking in with their fingers and toes to assess how they are feeling. We have worked with children who don’t speak up for themselves, even when asked directly, privately, if they are feeling cold. 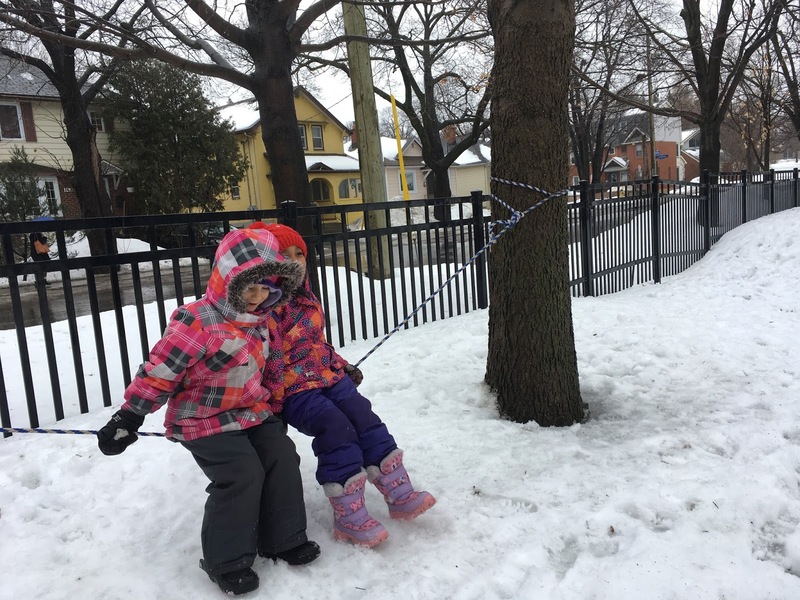 We have worked with adults for whom the cold is such a challenge that they are unable to be supportive of children being outside. We have worked with other adults who insist that pushing harder/farther is good for the children, that they are fine, even if seeming upset or cold. We have worked with children in winter who seek out opportunities to be indoors as much as possible, and others whom we need to insist take a break indoors so that we can know they are truly warm enough. 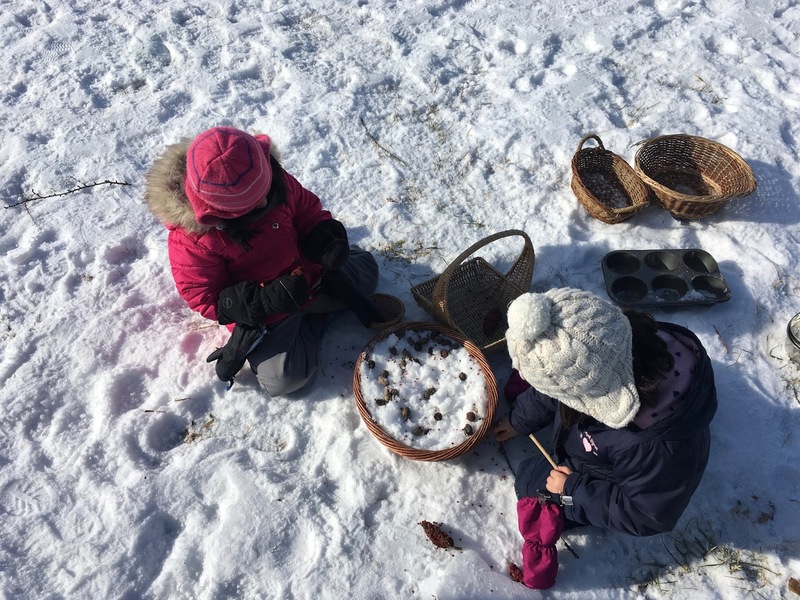 Working outside with children and families in winter there is a need to constantly assess, plan, arrange, modify, negotiate. We strive to let everyone know that we are listening to and respect their concerns, and also to help children (and adults) learn that they are able to dress for the weather, make smart choices, and spend extended periods of time outside in winter. 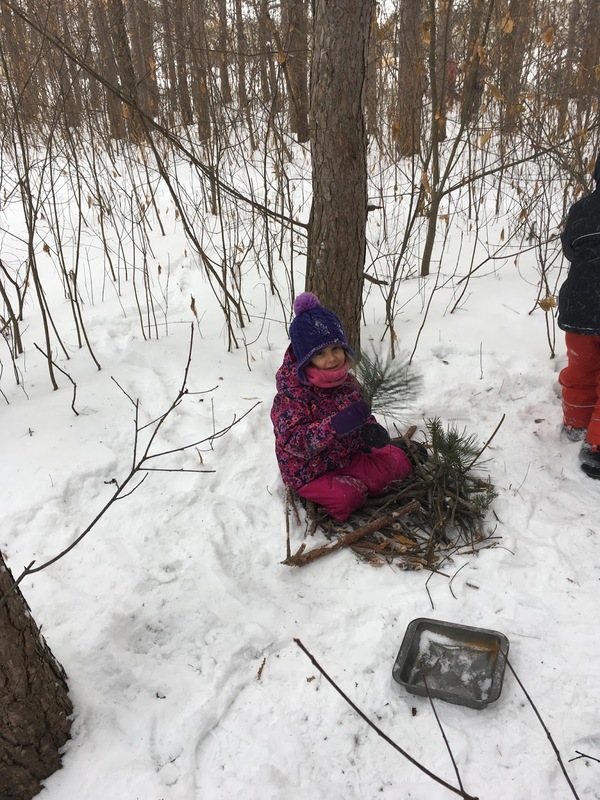 This winter, more than any in my past, I have had to check in with my teammates, with children and visiting educators, to make plans and modify them, about how to stay warm and still be able to learn through playing on the land. There is no standard template that is applicable across days and groups and sites. We have had to learn from our experiences, to listen to each other and our guts. I usually enter colder days with the hope that participants end the day wanting to come back. We then base our expectations- for time outside, for distance to hike, for indoor options, on this. Having this hope as my guide helps me relax and keep our approach child-centred. We experienced a cold day in December. We made plans, offered options, prepared. At the end of the day all was mostly fine, and some participants (child and adult) were affected by being out in the cold. We found out later that a family would no longer be taking part in our program due to temperature and weather concerns. I fretted, revisited, worried, questioned, discussed. It took me a long while to accept that I could not reach all families the way they needed me to, the way I hoped to. I felt certain I knew which family this was, felt sad, reflected, moved on. On our final day of working with this group, a parent volunteer was present who had been absent since that cold day. I thought she was the one who had opted out due to cold concerns. I greeted her, thanked her for coming, asked about her recovery from that cold day, reassured her that we would care for her and her child that day. She looked at me and smiled. She told me she had been away due to other commitments, not due to weather fears or that cold day. She told me she loved being in the forest, with her child and for her own sake. She told me she has seen changes in her child since he started coming to the forest- that he notices more, is more curious, asks more questions, spends more time outside. She said that they both spend more time outside now that they have been coming to the forest and have learned that winter can be interesting and fun. I cannot expect to always be able to meet the needs of every child and family that I work with. I need to shift my expectations of winter hardiness and experience and gear availability from day to day. I need to hope that I can nurture a love of winter and of resilience while also being ready to shift based on each group’s particular needs on any given day. The work is not always easy, the right path is not always clear, the end of the day is not always completely sunny, but the work is definitely always worth the effort. Thank you for this! 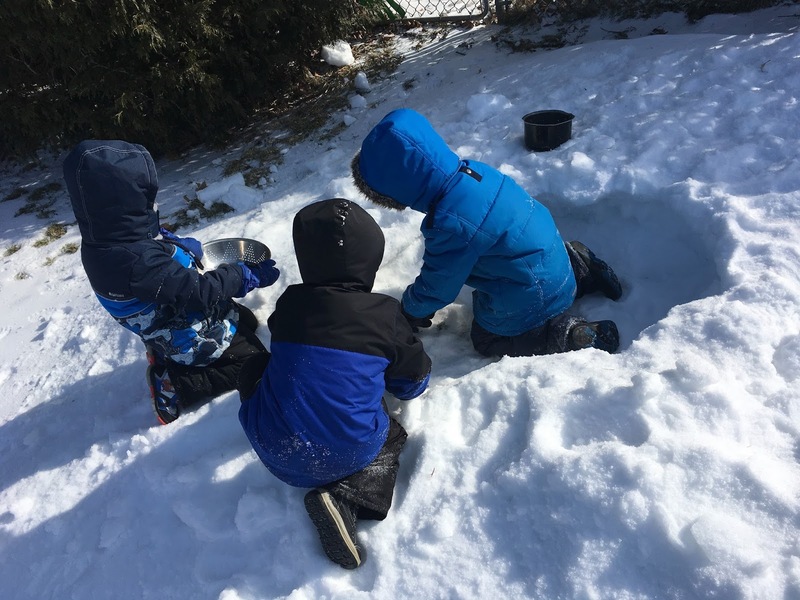 I work with many new families to Canada and others who sometimes struggle with our cold winters- such a good reminder to meet people where they are at! What are your favourite indoor activities when the cold forces you inside? When we need to spend time indoors we try to make a number of possibilities available so that children can choose how to spend their time. We often read and tell stories, make and write/draw in journals, create maps with paper of fabric or clay, create other structures with clay, make nests or other creatures homes with various natural materials, paint with natural materials, sculpt and experiment with snow indoors. These are a few of the ways we have spent our indoor time these last few months. We always keep an eye to the weather, though, so we can scoot back out again as soon as possible. Thanks for reaching out. I hope this is helpful!